Want to hear from even more buyers? We’re removing the three-session limit on 30 Minutes With... attendance this year, so you’re welcome to squeeze in as many of these popular broadcaster briefings as you like. A perennial hit at the Summit, our 30 Minutes With... sessions give you a chance to listen in as the kids industry’s top content buyers talk openly about their future plan and priorities, with plenty of time for Q&A and meet-and-greets. The best pitch is an informed pitch, so why not smarten up while you’re at the Summit. Using the world’s most competitive kids TV market as his lab, UK media buyer Dean Weller presents proprietary research on how kids are spending their time with social media and apps, and assesses the impact on TV broadcasters in the region. Who’s winning as more screens compete for kids’ attention? You’ll have to be at the event and in the room to find out. REGISTER TODAY! There is still time to REGISTER ONLINE and get in on our Lunching With... sessions. This highlight of the event gives you a chance to lunch in a small group with one of the industry’s most influential broadcast execs—click here and here to see who’s hosting! The lottery for seats gets underway on Thursday, January 5. Now in its second year as a Kidscreen Summit companion event, iKids 2012 is growing as fast as everything else in the digital media space and now features multiple tracks to better serve your digital media priorities. Have a look at the lineup HERE. If your team will be in NY on Monday, February 6 for Kidscreen Summit week, make sure somebody is signed up for this critical conference that explores how the latest intersections between mobile content, social media and web entertainment are transforming the kids market. Contact Kidscreen Event Sales Manager Joel Pinto (jpinto@brunico.com or 416-408-23000 x650) for passes. Extra $100 discount for Kidscreen Summit delegates on until Friday, December 6. The December 16 deadline for submitting projects for the Kidscreen Summit Pitch It! competition is fast approaching. The live pitch competition will showcase development concepts that appeal particularly to parents as the gatekeepers of their kids' entertainment consumption. If you have a show in development for preschoolers or kids six to 10-year-olds that appeals to parents as well, Pitch It! is an opportunity to build some early buzz in the industry. This year will also feature a focus group of parents onstage to give their feedback on the four projects that are selected to pitch—along with our usual panel of top broadcast execs. Get your show in the running for consideration and fill out an application form online. Summit conference program now online! We’ve just unveiled our complete lineup of 75+ keynotes, presentations, panel discussions, debates and pitching/networking formats. CHECK IT OUT when you get a chance, and then get registered to be part of the action. Our final Early Bird Ratesaving you $100expires on Friday, December 16. Calling all yogis and yoginis! When she’s not distributing kids programming, Bejuba! Entertainment’s Sandrine Pechels de Saint Sardos doubles as a yoga instructor. And to help you shake off the jetlag and get energized for the busy week ahead, she’s graciously agreed to run an early morning yoga class at the Summit on Tuesday, February 7 from 8:00-9:00. It’s BYOM (Bring Your Own Mat), and we’ll serve a light breakfast after while you network. Registered delegates are welcome, and you can reserve a spot once you get your pass. If this will be your first Kidscreen Summit, we are running guided tours on day one to help you get the lay of the land right away and not waste precious time trying to find sessions and events throughout the week. You can sign up for one as soon as you register for the event. Want to message 1,600 kids entertainment executives? You can if you sign up for Kidscreen Summit! Powered by Saban Brands for the second year running, our MyEvent platform lets you get in touch with other delegates easily to network and book meetings in the months leading up to the event. NEW SESSION: Keynote Debate - Does a Narrative Paradigm Shift Cometh? TV viewing is up overall, and yet youth audiences are abandoning television in favor of YouTube and Facebook. Big TV hits continue to generate huge L&M revenue for traditional producers, and yet new digital players have built larger audiences than some major broadcasters in under two years. Is all media headed for digital distribution, or will broadcast remain the dominant mass medium? Will content optimized for digital consumption demand new forms to be created, or will traditional content forms remain preeminent? Register today so you can listen in on another fierce debate about the biggest fault lines in kids media today. If you prefer to have quieter meetings away from the prying eyes of competitors, we have a handful of private business suites one floor above the Lounge, and are taking reservations now. Once you’ve registered for the event, email sales@kidscreen.com to book a space for your team to use throughout the event! $259 rate at the Hilton - for Kidscreen Summit attendees only! We've got a limited number of single and double rooms set aside for Kidscreen Summit delegates at a special price of just $259 a night. Sign up for the event, book your preferred-rate room before they sell out, and then enjoy all the benefits of staying on-site at the Hilton - sleep in later, avoid rush hour traffic and taxi lines, sneak away for 15 minutes of alone time, etc. Reservations can be made online or by calling 1-800-HILTONS and referencing Kidscreen Summit. If you’re all about volume viewership, you just can’t beat public broadcasters for delivering the biggest audiences in their territories. Join us at the Summit and find out what it’ll take to land your show on the widest-reaching kids TV platforms in the US (PBS Kids), Australia (ABC) and Canada (CBC). We’ve recruited their children’s programming teams to talk candidly to you about their content strategies & needs, the complexities of their greenlight processes, their internal dynamics, and how they tend to work with partners. You need this intel to crack in, and you’ll only get it at Kidscreen Summit. Register today! We have just opened our call for submissions to this year’s Pitch It! competition, which will showcase development concepts that appeal to parents as the gatekeepers of their kids’ entertainment consumption. So if you think your latest project would get their stamp of approval, fill out this application form by Friday, December 16 to be considered for a pitching slot. Save time for the Kidscreen Awards Ceremony & After-Party! Every chair was taken and all standing room occupied for 2011’s Mentor Meetings with some of the industry’s most respected experts in preschool programming, boys action properties, licensing and production management. So this year, we plan to double up on these sessions and speakers. Join us at the event and get a little advice from the best in the business. Everyone loved the new 10-minute meeting format last year, so we’re bringing it back to give you the time you need to win buyers over with a strong and well-planned pitch. Only registered attendees can participate in the lottery to be part of these sessions, so sign up today and get in the mix. The hard reality of producing kids entertainment is that if parents don’t like your show, it’s game over. So we think it’s high time we brought these critical first-lookers into the Pitch It! mix. This year, our popular live pitch competition will showcase four projects vying to win over a focus group of real live parents who have kids in both the preschool and 6-10 demos. Their feedback is bound to be revealing, so sign up for Kidscreen Summit now, and make plans to be in the room when they dish. If you want to try and get past our gatekeepers with a show you have in development, we’ll be posting the Pitch It! application form in the next couple of weeks. Check back here for the full scoop soon. There is something all great leaders have in common-they are able to inspire people to act. From Martin Luther King Jr. to Apple, leaders with the ability to inspire follow the same pattern. They don’t start with what they want done or how they want it done. They start with Why. Popular TEDx presenter and leadership expert Simon Sinek will kick off the Summit on Tuesday, February 7 with a fascinating exploration of The Golden Circle - how the human brain absorbs information and makes decisions, and why smart leaders share their fundamental beliefs in a careful pattern that starts with Why. REGISTER TODAY and join us to learn more about the philosophies, intrinsic qualities and strategies that separate leading companies from the rest of the market. More about Simon: A trained ethnographer and author of Start With Why: How Great Leaders Inspire Everyone to Take Action, Simon Sinek has been curious his whole life about why people and organizations do the things they do. Fascinated by the leaders and companies that make the greatest impact in the world, those with the capacity to inspire, he has discovered some remarkable patterns about how they think, act and communicate. He is best known for discovering the Golden Circle and popularizing the concept of Why - the purpose, cause or belief that drives every one of us. The Golden Circle is a naturally occurring pattern, grounded in the biology of human decision-making,that explains why we are inspired by some people, leaders, messages and organizations over others. 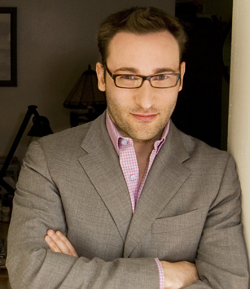 Sinek’s unconventional and innovative views on business and leadership have attracted international attention and have earned him invitations to meet with leaders and organizations including Microsoft, Dell, Intel, Chanel, the US Military, the United Nations, NASA, members of the US Congress and many other government agencies and entrepreneurs. Sinek has been featured in publications such as The New York Times, Wall Street Journal, The Washington Post, FastCompany, CMO Magazine and BusinessWeek, and he speaks at events around the world. The "How Great Leaders Inspire" talk he gave at his first TEDx event is one of the most shared TED Talks online. Check it out here. Is building relationships with buyers is your primary goal? Sign up now and get in on this opportunity to lunch in small groups with some of the industry’s most influential broadcast execs. To help you get your shows and development projects in front of buyers months before Kidscreen Summit, we're offering every company that registers someone for the event the opportunity to add two programs to our Kidscreen Connect screening library FOR FREE. More than 1,500 kids buyers and investors use this platform year-round to find new projects to develop and acquire. And everytime one of them checks out your stuff, we'll send you an email notification and tell you how to follow-up with them through our messaging system. You can upload two programs as soon as you sign up for the event, so what are you waiting for? Register right now and start connecting! If you prefer to have quieter meetings away from the prying eyes of competitors, we have a handful of private business suites one floor above the Lounge, and are taking reservations now. Get your passes for the event first, and then email sales@kidscreen.com to book a suite your team can use exclusively for the duration of the event! Yep, you heard us right! The world-famous aquatic themepark company is sponsoring the event's Delegate Lounge to get the word out about its initiative to invest in kids & family programming next year. Led by Scott Helmstedter and Eric Rollman, the SeaWorld team will be out in full force at the Summit, meeting with producers who have TV & film projects that fit the content theme of "where nature and imagination meet". Register for the Summit now and you can use our MyEvent messaging system to book a meeting with these brand-new investors. Have you ever wanted to work with a career coach to achieve more of your professional goals and be a better leader? On Monday, February 6 - the day before Kidscreen Summit starts - we’re offering a Leadership Training Day Master Class that will help you do exactly that. Presented in partnership with executive coaching and leadership development firm The Nebo Company, this full-day program will take you through the steps of mapping out a personalized vision for your business future, and then arm you with skills and techniques for the next phase of career growth at your current company or beyond. CLICK HERE to check out the full program. This kind of proffesional training is critical for anyone looking to get into the upper ranks of the kids entertainment business and flourish there, and it usually comes with a hefty pricetag. BUT Kidscreen Summit attendees can register for just $600 until Friday, November 11. Kidscreen Summit 2011 was a big success, but there is always room for improvement. And after processing all the feedback, we heard your message loud and clear - MORE SEATS IN THE DELEGATE LOUNGE! Well, ask and you shall receive. This year's lounge will have 30% more seating. We are packing in the furniture and meeting nooks to make sure there is ample space for you and your partners to get loads of business done together. Next year's gathering of kids entertainment executives will take place at the Hilton NY from February 7-10. Running over four days again to give you more time for networking, deal-making and professional learning, Kidscreen Summit is the one event you can't afford to miss if you're in the business of entertaining children. ™ Kidscreen Summit title, tagline and logo are trademarks of, and the event is produced by, Brunico Marketing Inc.